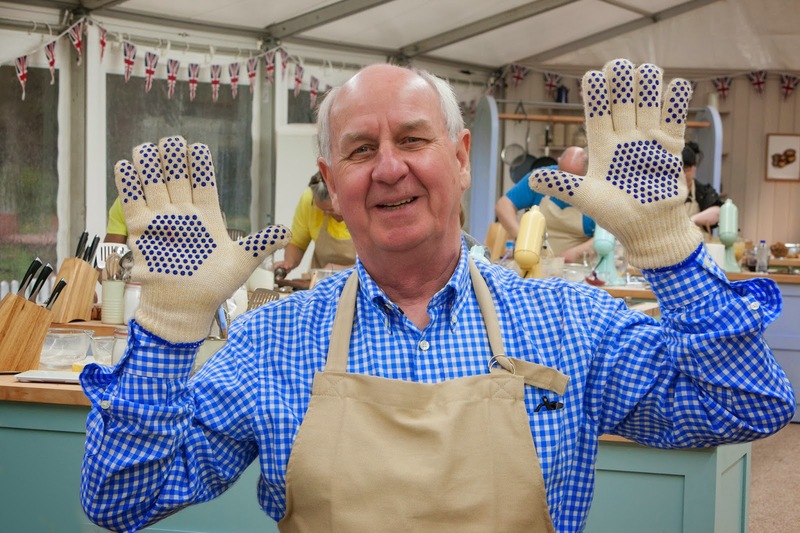 The Custard TV: Bake off returns and so does innuendo on BBC ONE! Bake off returns and so does innuendo on BBC ONE! If you happen to be on twitter today you'll know there was huge excitement about the return. With all the tweets of joy you'd be forgiven for forgetting that actually this is basically a show that celebrates cake! Mind you, it's a show that celebrates cake! For its fifth series Bake Off has moved to the mothership BBC One. Much to my relief the show has survived the promotion unscathed. I initially feared a glossy ‘look how we’ve grown’ make-over – in the same vein as when Masterchef went all X Factor-on-Red-Bull a few years ago. That the status quo remains is a testament to what a wide-reaching audience-uniting format the show is. There was no boastful ceremony or grand unveiling on the new channel as the series got straight down to baking. 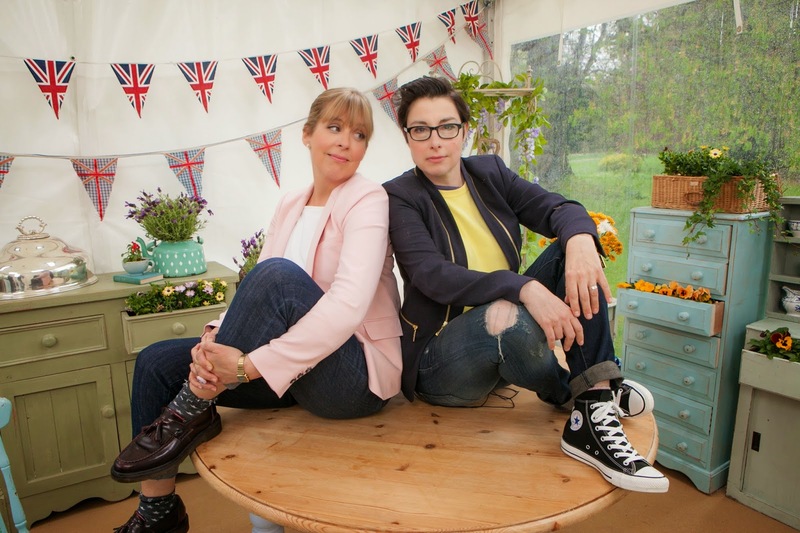 Hosts Mel and Sue are back. The pair oversee proceedings in that infamous white tent like a pair of eccentric spinster Aunt’s tipsy on snowballs at Christmas. Much like those aunts, you feel safe in their company and look forward to their smutty quips. (“there are two ways to make a swiss roll..first of all you push Roger Federer down a hill...”) These two are now so synonymous with bake off their loss really would be like your bun without the cream. Sometimes I wonder whether it's the Mel & Sue effect that draws us in even more than silver fox Paul Hollywood, and everyone's Mary Berry. Kicking-off with the signature challenge – swiss roll with the inevitable twists – we’re introduced to this year’s keen-eyed bunch of bakers. 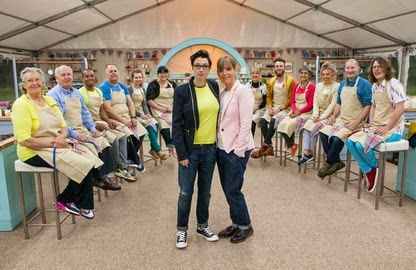 We’ve got your ‘personality’ bakers including Amy Lamé / Lisa Riley hybrid Claire, nerd-baker Jordan (colour coordinated shirt and clips - how fetch) and hunk-in-waiting Iain. Then there’s your core gaggle of nice folk including matriarchal Nancy and retired navy lad ‘Stormin’ Norman (“that’s some of the best fanning I’ve seen this week”) it’s a relief to see all of baking life is once again in that over-sized Homebase gazebo. The signature challenge saw a variety of imaginative twists on the cake tin favourite. Shakey-baker Martha (let’s give her deserved credit - she’s seventeen and Bake Off’s youngest ever participant) rolled-up a tiramusu concoction and instantly dismissed naysayers who may suggest she’s too young to bake. Twee Mum Kate got our Hummingbird bakery obsessed nation salivating for her red velvet roll but the dry and cracked results led to that familiar patronising laugh from Paul. “It’s dry!” he exclaimed accompanied by a grin wider than the Thames Estuary. But it was demure builder Richard who secured himself as an early favourite with his pistachio and strawberry roll with Paul rather sweetly claiming he was in the wrong job. NB: a special Mary mention went to his ‘lovely spiral’. I can’t not mention Claire’s ‘Chocolatey Orangey Swirly Roll’ a cake that looked liked the result of a blue Smartie fuelled playgroup bake-off. Oh Claire, twenty minutes in and she already has a perma-look of despair on her face. Then she cried. Shall we show her the door now? Next, the technical challenge – as always set by Paul or Mary to one of their own recipes. This week it’s Mary’s Classic Cherry Cake. Cherry cake? Jokes! About popping your cherry! It’s like someone had planned it (“you have got two hours to pop Mary’s cherry..in the oven and out again”) Oh they were aplenty. This was a good chance for us to get to know a few more of the contestants – most of whom do feel underwhelming at the moment. Rather inevitable as there’s so many of them at this stage. Smug Enwezor a particularly unappealing figure: “My god, I can do it!” and “I can’t believe I’m putting almonds on one-by-one” Mate, this is Bake Off, what do you want? Your own personal almond placer? Oh one sec..
After what felt like a Carry On film full of cherry innuendo (Paul to Jordan: “I couldn’t find your cherries!” I admit I too was surprised at that.. though we were told the IT worker had a girlfriend back home so I shouldn’t have been) the quietly witty Nancy was declared the winner. In what felt like no time at all we were at the final round – the showstopper. Or the trafficstopper as I prefer to call it. You really are just waiting for that car crash. You don't want their marvellous creations to come crashing down around their stressed out feet, but secretly, you do. Tasked with creating thirty six identical miniature cakes the gang came up with a variety of eye-popping treats. Iain discovered size isn’t everything when his multiple-tiered lemon drizzle offering was described as flavourless and, our old friend, an uneven bake. Richard braved the wrath of traditionalist Mary with his raspberry lemon genoise slices with lemon drizzle in a separate dropper but “just about got away with it” but it was Nancy who shone through with her guillotine carved jaffa orange cakes . “What perfection” Mary announced. After a whistle-stop hour we were back at that table with Paul, Mary, Mel and Sue deliberating who was to be crowned star baker who would get the push. In an ever so inevitable departure Claire and her glasses waved goodbye to the tent and super Gran Nancy was declared the star of week one. And there we have it. Oh welcome back Back Off, it’s good to have you back. So how did the show's first outing on BBC ONE shape up? I’ve definitely got my eye on Enwezor. If only to find every opportunity to make plenty of Shamen-inspired Enwezor Goode jokes. Gentleman builder Richard is definitely my one to watch. We’ll be starved of any future shirt and hair accessory matching but I think it’ll be Jordan. Next week: biscuits, ice cream, signature savory treats, 3D showstoppers. See you then!